Happy Friday to you! We are waking up to areas of smoke and haze across Northern Nevada. Smoke is drifting into the area from large wildfires burning in California and in the Pacific Northwest. 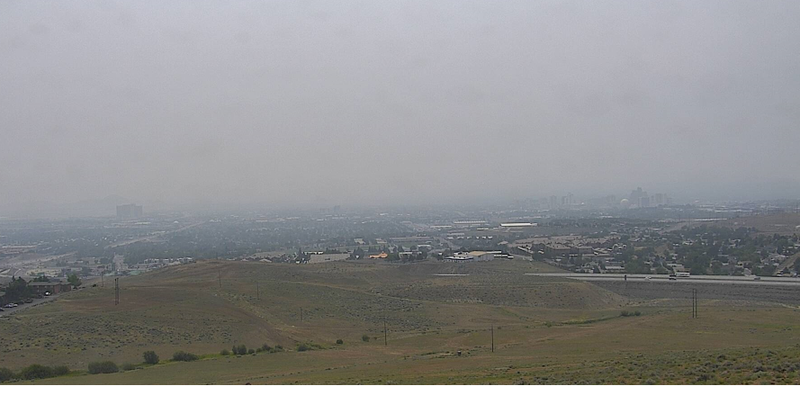 Hazy skies will likely continue over the next few days… Right now air quality has reached ‘unhealthy’ levels for sensitive groups, according to the Washoe County Air Quality Management Division. People sensitive to air quality should limit their time outdoors until air quality improves. Warm weather will also continue today with high temperatures reaching the mid 90s in Reno & Sparks. Temperatures in Carson City are expected to peak in the low 90s with mostly low to mid 80s temps projected around Lake Tahoe. Slightly warmer weather is anticipated by the weekend as high pressure builds in over the west. The National Weather Service in Reno says several California fires are contributing to the smoke and haze coming into the Truckee Meadows region. The Northwest flow of winds have brought in smoke to the Eastern Sierra. The Dodge Fire is burning 70 miles northeast of Susanville, California. It has burned 10,500 acres and is 35% contained. The Rocky Fire is burning east of Lower Lake and stretching into Colusa, Lake and Yolo counties. It has burned 69,636 acres and is 62% contained. And the Lowell Fire is threatening the Placer County communities of Dutch Flat and Alta. It has burned 2,304 acres and is 90% contained. 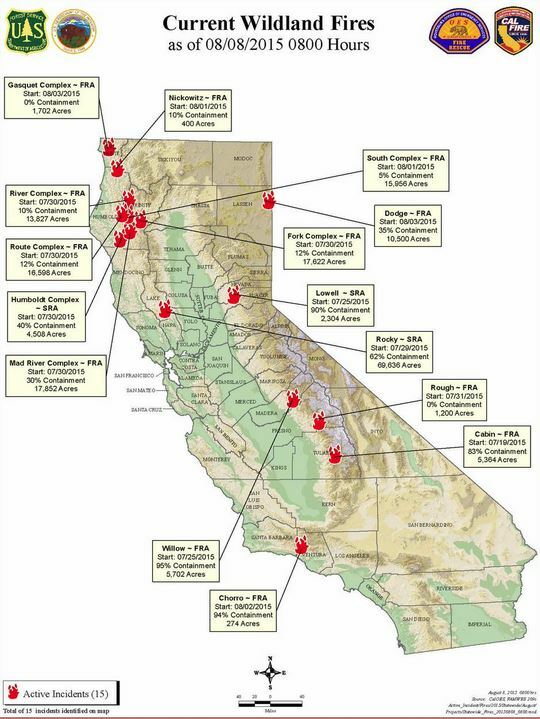 The smoke is also coming from the fires in Humboldt and Trinity Counties in California. The smoke conditions should improve slightly Saturday, but it will remain hazy. Some haze is still possible for Sunday, but a return to clear skies is likely Monday and Tuesday as winds shift to the south. According to Airnow.gov, the air quality in the Truckee Meadows region is moderate. Sensitive people should consider reducing prolonged or heavy exertion outside. 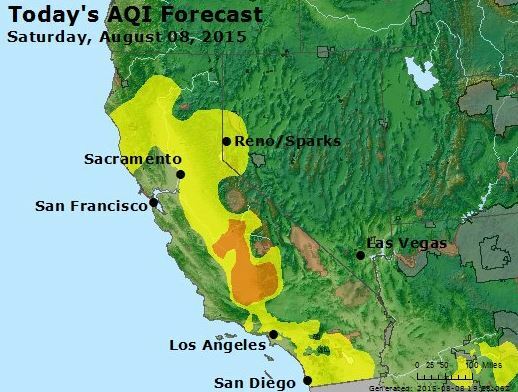 RENO, NV – Smoke from several California wildfires is affecting the air quality in northern Nevada on Saturday, August 8. The Dodge Fire north of Susanville has burned 10,500 acres and continues to spread. Containment is at 35% as of Saturday. Smoke from the Dodge fire is likely to affect northern Washoe County through Wednesday, August 12. The Rocky Fire burning in northern California is 62% contained after burning almost 70,000 acres and all evacuations have been lifted as of Saturday. My location near 5th and Evans, near downtown city bus terminal. Outside my apartment I can barely see mountain range to the north-northwest, and to the northeast has vanished. I was watching TV, noticed it getting dark outside before it should, no rain in forecast. Sky looked strange – light outside looks wrong. So I checked news sources and found out why.